The day, the EXTRA day, is almost over! As I look back over this month, boy it was busy and it was filled with lots of fun and good times. I was out late tonight helping my friend Judi with her baby quilt. We are making good progress and had such a good time. She spoils me with yummy things to eat. It's been good to reconnect and good to teach. She's doing so well, I'm very impressed. Working with Minkee is really difficult and she's being so patient. Here she is sewing away, looking very serious. Don't you love her naturally curly hair! She got one row of the center done tonight...all squared up and looking good! I'm so proud of her. I finally got my Valentine Exchange cards into my book. The book is so full that next year I need to get a new album. It's really fun to have them all together. My friend Suzanne made the one on the outside. I love the sparkle jewels in the center. It's pretty dimensional, so I put it on the outside to enjoy. Miss Annabelle bought a new blanet box for her the other dolls. She decided to store her Valentines in her new treasure. Here's a picture of my dad singing his heart out at his choir concert Sunday evening. They sang 16 song! He really enjoys it. He's the man sitting down in the front row. He's so funny and just loves being in the choir. They are going on the road later this week to sing at two other retirement homes. Well, I think it is time for bed. Mixed rain and snow again! It's been a busy day indeed. The fire is nice! So, we get an extra day this year! 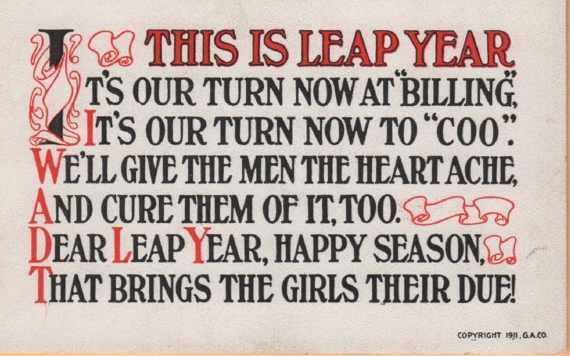 Don't you think Leap Year is so odd. I guess we should use the day to get lots done or go and play! I wish I could just have a grand time, but too much work to do, so will grab a coffee, get the fire going, and get to work. What are you going to do with your EXTRA day! I seem to be in the business of adopting dolls this year! Jim and I were at a sale last Thursday and I was looking at a pile of stuffed animals, all just thrown together. I spotted this fine lady and was so excited to find a peg doll! I didn't see her price, but was packing her around until I found Jim again. I showed him my new found doll and told him I didn't know how much she was. Then he showed me the sticker I had missed on her arm- $1! I almost had a heart attack. I'm not sure if she's really very old or not, but I just love her. She's meeting all the dolls in the tea room and getting comfortable with her new home. She is a lucky lady and so am I! I must find a name for her soon. I haven't named my other peg doll yet either. Last week when I was at the doll show, I met a lovely local doll maker-Aleta Breese. I had purchased some special ribbon at an antique mall and I didn't know it was her space. She had all the spring colors at the doll show and I had to buy some in anticipation of Easter projects...don't they look like Easter Egg colors? Here is a picture of her booth...so sweet and feminine, light and cherry. She was so kind to share about her dolls and bunnies. Of course I fell in love with them. I guess I'll have to save up for another special doll! All these talented doll makers...I am fascinated by them all. Don't you adore her special bunny....Miss Amelia Ruffleflounce. I have borrowed her pictures from her lovely blog....http://thesillybear.blogspot.com. Please visit her to see her other bunny and her doll. I think I'm longing for spring. I was out shopping with my husband yesterday and when I we came home, I slammed the car door on my hand. It sure hurt and today my finger is a purple sausage with cuts and bruises. I'm afraid I'm a bit slow today. I am thankful that nothing is broken. I was looking over my blogs from last year as I couldn't remember when I joined Miss Spenser's Teacup Thursday. It's coming up to a year in March. Today is my #47 post. It's a pretty burgundy color and a simple design with a lovely handle. The cup and saucer are made by the Spencer Stevenson company and it was made in England. One of the reasons I chose it was because the color goes with my new peg doll that I found at the doll show last Saturday. She's quite lovely and I love the colors in her dress. She's has a lighter frame and quite a pensive look on her face. I love peg dolls. I wanted to share these other items I recently found. These little children's gloves came from Paris...so very sweet. I found this little autograph book from 1920 for $1.00! It's from Australia and so charming. I just couldn't leave this sweet little rack behind. I think I'm going to hang some vintage lace on it in my tea room. My youngest daughter always calls me mama and I just love it. Maybe she'll have this someday. Thank you Donna and Spenser for hosting another Miss Spenser's Teacup Thursday. Our last Thursday in February. Will March come in as a lion or a lamb? It's President's Day Weekend...a three day weekend for many working folks. Now that Jim and I are retired and loving it, these holidays seem a bit different. I'm having a cup of coffee this quiet morning, catching up on some blogs and checking out some new blogs. Old Abe and George could never have imagined the world we live in not! 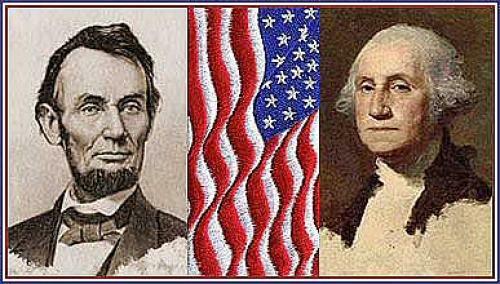 I was thinking about these two presidents and how we used to study them when I was little. I have always loved history and I guess I have nostalgic memories of grade school. Making black cut out silhouettes always pops into my mind! Did you make those when you were young? While we learned funny little facts about these men, we also gained a respect for the presidency. Watching primaries and hearing the latest scandal about JKF, it's really quite sad how things have changed in the political arena. I don't want to get political here, but I wish a candidate could come from a grass root level, like Lincoln, and have a chance to become president. That's just never going to happen now. Seems you have to sell your soul and be backed by huge amounts of money to become president. That makes me sad for the good old USA. So, on to a cheerier note, I have had a fun weekend. Jim and I went to a few estate sales...more inventory for Jim's March antique show and my Etsy shoppe! We went to a wonderful doll show yesterday (will blog more on that later) and tonight we're going to our daughter's house for an belated birthday dinner for Jimmy. Tomorrow, I'm going to help my friend Judi work on a quilt for a new grandbaby one the way. She's never quilted, so this will be a new adventure for her. I need to bake a cake this morning for the birthday boy! This week has been so much fun and I have really enjoyed all the beautiful blog post centered around Valentine's Day! I'm sorry it is over, but I will leave my decorations up until the end of the month and enjoy all the cards I received. It's Miss Spenser's Teacup Thursday and I saved one of my Valentine gifts to share today. Actually, I ordered these two pink Lusterware cup and saucers for myself from Christine LeFever. I have been looking for one to honor Tasha Tudor and she had a pair on her website. I was thrilled because she too is a Tasha fan.Anyway, I didn't open my package until yesterday and I'm delighted to share them today. They are so dainy and sweet. This is the little note she tucked into my box...so cute. This is a sweet drawing of some pink Lusterware that Tasha did for her cookbook. I've been posting very long post on my blog this week, so I'm going to make this one short and sweet! It's been a lovely week. Remember to keep you heart right and good~all year, not just at Valentines. What a fun day filled with cards, treats, tea time, dinner and lots of love! I baked some heart scones this morning while Jim took my dad to the cemetery...such a kindness to my father. An easy drop scone recipe and fun to make. I filled the center with Mackay's 3 berry Scottish preserves. I sprinkled the finished baked product with powered sugar. Yummy! When Jim came home, it was time for tea. Just scones and tea as we wanted to go out for an early dinner tonight. It was the perfect time to use the little snack sets my friend Kristen had give to me for Christmas. Scones my dear? Cup of tea....milk or sugar? 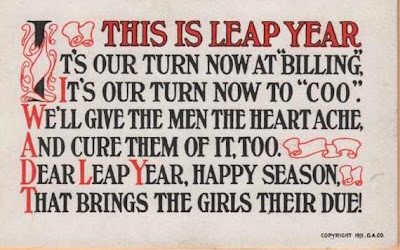 Let's make a toast to love and enjoy the day! 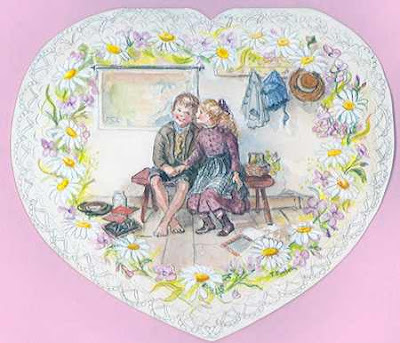 After tea, it was time for gifts and opening my Tasha Tudor Valentine exchange cards. I like to save my up for the 14th. Here they are just waiting to be opened and shared. Annabelle received lots of cards for her friends too. She even got a box of French pastries from her friend in Massachusetts in a little pink box. I promised that I would post some pictures of the Valentines I made for my Tasha friends after Valentines, so here they are! I used Terri's pattern from Artful Affirmations for her elegant shoes. I had to make them more flat for mailing. Thanks for the inspiration Terri. I really had so much fun making them. Of course Jim and I had some presents for each other too. He gave me a darling vintage sterling sewing kit that I adore. Isn't it charming? This is the hickory nuthead doll we found a few weeks ago. 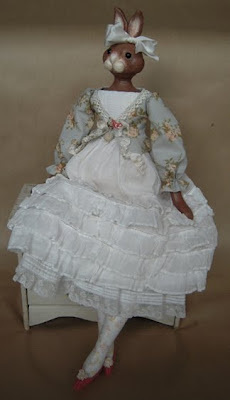 I'm not sure how old this one is but her dress is made from a really great older fabric. LaVonne, my fellow nuthead friend, sent me this cute vintage Valentine and I had to show it off with my new nuthead doll. I gave my sweetheart a wonderful book on Anri woodcarvings and a set of Anri bookends. He's totally absorbed in his new hobby! As the day slips away, what a happy heart I have tonight. I love Valentine's Day! I love you Jimmy! February 7th...One Week Until Valentine's Day!